Home DIY Projects	Easter Basket Jars! Happy Throw Back Thursday! Easter is little over a week away, so today I would like to share with you my little DIY Easter Basket Jars I made for my fairy god-children a few years ago. Come see how to make a quick, easy and inexpensive it is to put together this fun little craft! I started with various sizes of pickle jars, pimento and baby food jars. Any sort of jar with a screw top lid will work fine. After thoroughly cleaning the jars and lids I glued some knobs from my stash to the top center of each lid using E6000 glue. Once the lids are dry simply paint them with a few light coats of your spray paint color of choice. I used a mix of pastels in blue, pink and yellow. Note: Make sure you paint the under side of the knobs while you are at it for complete coverage. I bought an assortment of Easter Grass, jelly bird eggs, and chocolates from my local grocery store. I like to use paper grass instead of the plastic, because it is more environmentally friendly and biodegradable. I filled each jar with an assortment of grasses, jelly beans and candy. 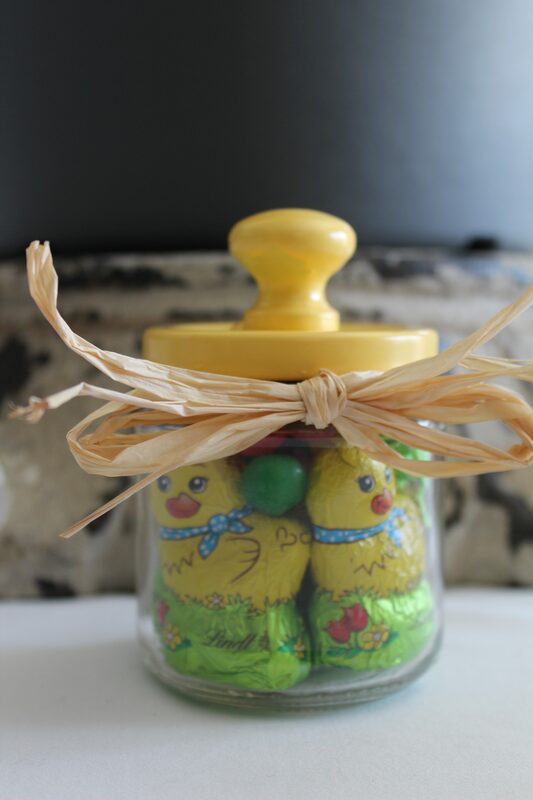 Instead of a knob on this jar, I glued a sweet little chocolate bunny on top and filled it with jelly beans. A little bit of raffia finishes it off nicely. Here is another little jar with a chocolate bunny and some jelly beans and chocolates shaped like carrots. You can see the different sizes and options. You really can fill them with whatever your littles love best! Also, use what you have in terms of raffia, bows, ribbons etc to embellish the jars. If you are worried about using glass jars, there are many plastic options that would work nicely too. This one from a pimento jar. Aren’t they cute? Wouldn’t this be a fun project for a girl scout troop or a school craft? I made up a bunch of these jars one year and gave my fairy god-children first pick. I can’t tell you how much I miss those guys!! I wish you all a very wonderful Easter! And other than the bunnies, Easter eggs and candy, let’s all remember the real reason we celebrate. Thank you, Jesus! Saving Money on a Move AND Best Plate Divider/Protectors!